Welcome to the 9th of the 12 days of Christmas. If you have not yet received your “Nine Ladies Dancing” I’m sure they’re arriving later. And while it may just be the 9th day of the 12, it’s amazing how fast things change. I dropped Samuel off at the Ice Cream Shop yesterday for work and Bud and Carol were there early, taking down the ornaments that had hung from the ceiling since about Thanksgiving. They were putting away their Christmas music for the year, which means that those who work there revert back to their old playlist for the hours they’re serving customers. At a New Years Eve party we stopped at the night before, a Christmas tree made it onto the bonfire. It’s amazing how fast those things burn. But the smell of burning spruce was a nice change from the smell of all of those fireworks going off all around us that night. Even today after worship we’ll have folks stay and help pack up our Christmas items for the year and start figuring out what this place looks like and feels like when it’s decorated for our weekly worship. It can seem like Christ has come…and gone. The decorations change. The stories change. The calendar changes. People come up with lists of things they want to accomplish in the new year…resolutions, if you will. And we reflect on what has happened over the past year…the joys…the pain…the things we learned…the things we experienced. The things that shaped us and moved us and defined us. But when we have moved on from that sweet little baby Jesus, we may have an empty manger, but we have an occupied throne. We have looked forward to his coming to save us from our sins and now we settle into the reality that we have a new king to not only rule the world but rule the hearts of those of us in this world of ours. Part of the message of Christmas is there’s a new ruler in town, a new sheriff, one who seeks a response of faith and faithfulness from those who celebrate his coming. There is a new king in town, say these magi. The stars have revealed that to them. 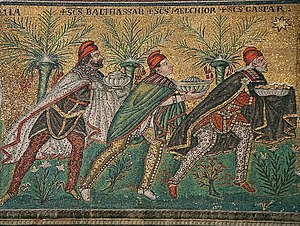 Now, it is important to remember a couple of things about these magi. First, Christmas may have been 8 days ago in our calendar, but it’s been a couple of years in the Biblical story. We may bring wise men in with shepherds and angels and manger, but they’ve all moved on since then. Second, they aren’t kings. They are magi, or astrologers or court priests. “Kings” is a mis-translation. Third, there aren’t three of them. That’s in the song, but not in the Bible. There could have been many more. The arrival of these travelers from afar is the root story of Ephiphany, which is officially celebrated on January 6th, commemorating the magi. Ephiphany means “manifestation” and it’s in this story that the Son of God, the King of Kings, and Lord of Lords is manifested, made known, revealed to the rest of the world. And so it happens. These rich wise guys from the east know this prophecy from Isaiah and come to Jerusalem knowing that THERE they will find the new king of the world ready to usher in an era of peace and tranquility and love enough to go around. Someone who really doesn’t like the prospects of a new king coming to town are the old kings. New kings are threats to existing powers. And Herod wants to destroy his new rival. So, he tells these magi to come back to him and tell him exactly where the child is, not so he can pay him homage but so that he can destroy him. There is a spirituality of Epiphany that comes out of this story to us. Epiphany is about meeting Jesus in a new way. It’s about the unexpected. And all of what we talked about leading up to Christmas and even on Christmas day was about trying to push our way through the commercialism and the sentimentality and the busyness of the Christmas season so that through it, we might see the Christ child in a way that was deep for us. We are surprised by so much in this life, why not be surprised by a God who pursues us so much that he’s willing to leave the side of his Father in Heaven to come down to earth. And the hope and the prayer is that, after meeting Jesus in a new way, after being challenged, after being surprised, and excited, and moved…we will follow the magi and go home by another way…that we will turn our life in a new direction. There is a spirituality associated with Epiphany that answers the practical, everyday, “so what” of Christmas. It says, the Light of God has come, and I…we…will go home by another road…we’ll take a new path…preferably one that is shaped by and towards that new king we just welcomed in diapers. It’s a prayer that maybe, THIS YEAR, Christ will make a difference in how I live my life, in what our family looks like, in how I do my job, in what responsibilities I take on or let go of. Maybe I can go in a NEW DIRECTION this year. In the secular world, it’s funny how this Epiphany time corresponds to the changing of our calendar. We shoot off fireworks. We parade down the mountain with torches. We wear goofy hats and pop poppers. We toast. We reflect on what the previous year held. And we look ahead…many persons making resolutions. This year I’ll finally lose 20 pounds. This year I’ll get out of debt. This year I’ll spend more time with my kids. This year I’ll exercise every day. This year I’ll read more books. This year I’ll read through the Bible. This year I’ll get up every morning and pray. This year I’ll go on a mission trip. This year I’ll have devotions with my family. This year I’ll write every day about where I’ve seen God. And, it true, that most of these spiritual resolutions go the same way as our less spiritual resolutions. We may start strong…and with the best of intentions…but then slip and slide and let it go and forget about it all together. As we, as a congregation, cross into the new year, we have a whole new space. And it’s going to take some time to figure out how we LIVE in it and what MINISTRY looks like in this place. “We’ve come a long way, baby”…but we still have a long way to go. When we were sitting over there in our 30’ x 30’ building with a port-a-potty outside, it was pretty easy to let things revolve around the pastor…and let’s face it, I eat it up when it revolves around me. I like being the center of attention. When we tell folks we don’t have running water, we don’t have space, we have a leaky roof, there’s so much we can’t do, it’s easy to not do much and kind of justify it. But not any more. We may have some financial realities we’ll be working with for a long time, but we now have a lot of space. And we have a lot of heat. And we can dream. This past week I met via phone with a ministry coach down in Washington to help me pastor this place as we find our new directions together. This coming week Sheila and I will meet with someone at our Conference office to think about how we start getting policies and practices REALLY into place to take protect our children, to work on managing our debt, to thinking about building use procedures. And, even here on January 2nd we know that we need persons to offer their time to provide an activity during our sermons and persons to help count offering and persons to teach Sunday school and persons to finish off rooms and figure out how much it will cost, in each room to move in this direction. There is a spirituality of Epiphany which calls us to enter this season of our life with some changes about who we are, what we do, and what’s important to us. We have a new king. Christ has come. We have a new year. We can lay aside the bad habits of last year. And we’re called to travel in a new direction. Will you follow the wise men and live your life and your life of faith by another road? This entry was posted in Christmas, Epiphany, Sermon by jimdoepken. Bookmark the permalink.